Last Wednesday night, well into the still of Thursday morning, in fact, I had an encounter with a woman who wasn't my wife. No laws or vows were broken, but Annabelle and I did sort of share a certain intimacy...across time. I had just finished writing a piano piece called "C in Three." It was a "pitch" for a Netflix documentary. Based on their "temp" music (an example of the type of sound they want for their movie) I decided to follow the restriction that the composer of the example had -- to compose only on the "white keys" of the piano; so, in the key of C, with no accidental sharps or flats. "C in Three" was the result of a very quick turn-around writing session. I decided it would be cool, since the piece is in kind of a camouflaged waltz time, to set it to a video of someone dancing a waltz. What I found was not exactly what I was looking for. I found Annabelle Moore, but she was not waltzing. But in her, I found a soul, long-faded from this world, preserved in the small square of a moving picture like a firefly cupped in gentle hands; an imperfect immortality of beauty and vivacity that -- I have to admit -- made my heart flutter. 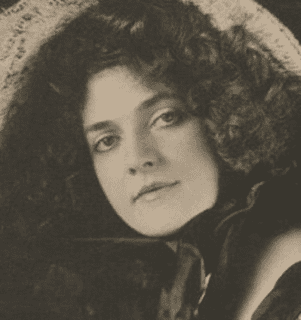 Annabelle had made her performing debut at the Chicago World's Fair in 1893, as a dancer, at the age of fifteen. She later went on to a career in stage, dance and early film in New York, according to Wikipedia. She eventually also become a member of the Ziegfield Follies -- the original Gibson Girl, in fact. None of this mattered to me, though -- in fact I knew none of it, sitting in the low light, in the glow of faders, knobs, and musical instruments in my small home recording and composing studio, well after midnight. I just found her, dancing her "Serpentine" and her "Butterfly" dances through the blotchy flutter of digitized old film, flashing yellow and orange and blue in the hand-painted style of the time. But, when I matched up my music to her moving form, the breath I lost went across the veil to her. There was a wonderful alchemy between her movements and my notes -- either the happiest of accidents or a gift of fate. To say neither of us had intended to make art together is to reach an absurd level of understatement. I had never heard of her and she never even knew I'd be born, having left this world seven years before I would enter. But there she was -- there she is -- alive and smiling and passionate in her movements, reaching through the span of more than a century, creating a spectacle of flowing fabric and glowing beauty and unpretentious and subtle sexual energy that must have stunned all of those suited and capped men and their corseted women sitting to watch this new art form of motion pictures. Together, she and I made new art. Two spirits melded by what I hesitate to call "accident." She, a woman born in the corpse-cluttered wake of the Civil War as I had been in that of Vietnam. She is gone; I am here. But "Peerless Annabelle," as she was called during her fame, is still here. She will always have her own little space to dance in my heart. If "C in Three" is bought and used for this documentary, I will gladly accept the money, but the piece will always be hers. I didn't write if for her, but I do give it to her. Whatever happens, this little YouTube video will be a lasting record that she and I "met," proving, in very real sense, that death is not really the end it seems. As you watch, pay attention to the section in black and white. This is where and when I really saw her and felt the resonance that carries so far into the future from her smile. If she can see me from where she is, I hope this, at least, makes her smile again. Stunning. Thank you for an beautiful start to the day. You're welcome, Kat! I'm glad you enjoyed it.